Also on Friday, the Standing Committee of the National People's Congress (NPC) approved the nomination of Wan Gang, president of Shanghai's Tongji University, as minister of science and technology, replacing Xu Guanhua. Xu Shaoshi replaces Sun Wensheng as head of the Ministry of Land and Resources. 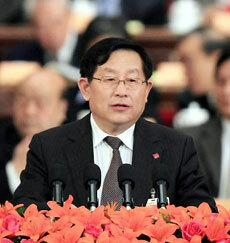 Chen Lei was appointed minister of water resources, replacing Wang Shucheng. Wan Gang, a member of the China Zhi Gong (Public Interest) Party, replaces 65-year-old Xu Guanhua, becoming the only current non-Communist party minister in China's State Council. A former automobile engineer at the Audi Corporation in Germany, Wan, born in Shanghai in August 1952, was president of Shanghai's Tongji University before his new appointment. The Standing Committee of the National People's Congress (NPC) approved the nomination at the conclusion of its four-day bimonthly session on Friday. Wan, a Shanghai native, is vice chairman of the Central Committee of the Zhi Gong Party, a non-Communist political party with more than 15,600 members. Founded in 1925, the China Zhi Gong Party is mainly composed of returned overseas Chinese, relatives of overseas Chinese, and noted figures and scholars who have overseas ties. Political observers said Wan's appointment was a notable move in the political arena after President Hu Jintao urged other political parties to play an active role in pushing the country's reform and opening-up. In the 1950s, a number of non-Communist members were appointed ministers, but they were soon dismissed during the "anti-rightist" movement. In recent years, the CPC Central Committee has issued a series of directives and recommendations to promote non-CPC members to political positions. In 2005, the CPC Central Committee issued a directive, requiring all local governments and departments at or above county level to open top jobs to non-CPC members and non-politically affiliated people. The directive also demands the State Council, the country's highest administrative body, pay particular attention to appointing non-CPC members and non-politically affiliated candidates to ministerial positions or their equivalents. During the election of delegates for the CPC's 17th National Congress, scheduled for later this year, provincial CPC committees are required, for the first time, to listen to the opinions of non-Communist parties before a shortlist is made.